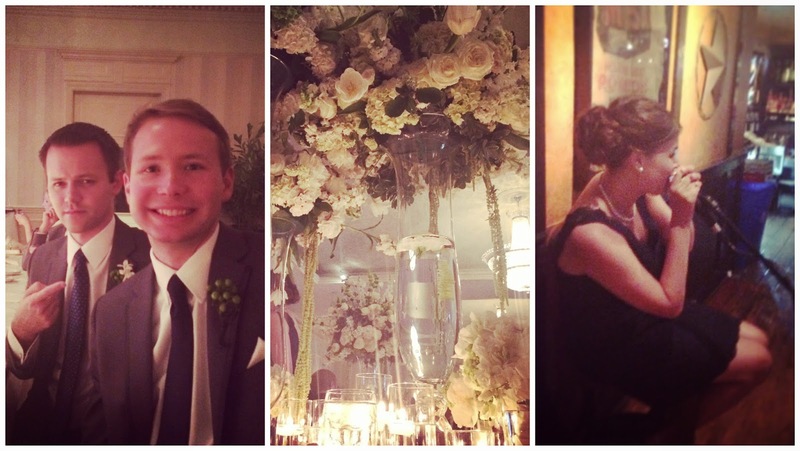 Lisa loves John: Blake and Ginna's Wedding! Hii!! We are almost home! John and I were stuck in Houston last night due to inclement weather and we are finally taking a flight back home to Albuquerque this morning. Although I will pretty much be straight off to work, I am so looking forward to seeing my sweet puppy and getting a good night's rest tonight! We had such a lovely time in Charlotte celebrating Blake and Ginna's wedding, and aside from the weather issue in Houston when leaving, everything went off without a hitch! ONE | John and I had an early flight on Thursday morning to head to Charlotte. When we got to the airport it took us almost an hour to check our luggage! When we finally got through, everyone on our plane had already been seated, but we were just thankful to be on! Once we arrived in Charlotte we checked into our hotel, ate a nice meal out on a patio, and did a little shopping. Let me say, I live in New Mexico, and there is pretty much no shopping here... Really, no shopping. So needless to say, I was quite excited to see a Nordstrom right across the street from our hotel! We ended Thursday evening at Ginna's parents house who were hosting some of their family and wedding guests for dinner. It was lovely to get to see the bride and groom (and meet some of their family) before the craziness of the weekend started. TWO | Friday morning was spent relaxing and heading to a pre-rehearsal lunch with Blake and Ginna, as well as Jim and Carrie (Jim was co-best man with John). Jim and Carrie live in Michigan, and it was the first time seeing everyone since moving, so it was great fun catching up. THREE | After lunch we ran a few errands and headed off to the rehearsal. The church was beautiful. When John and I got married, the most stressful part was the rehearsal. No one knows what they're doing and everything looks like a hot train wreck. Anyone else experience this?! Anyway, Ginna handled the whole thing beautifully, and from as far as I could tell, wasn't stressed one bit! FOUR | The rehearsal dinner was so yummy! It was hosted at McCormick and Schmick's, and let's be real, you can't go wrong with a nice steak and good wine. After the dinner, the majority of the wedding party went out for drinks at a place called Char Bar (I'm not totally sure that's the real name, but that's what everyone was calling it...). It was good to get to know the rest of the wedding party since the majority of the people were from Ginna's hometown in Newport Beach. FIVE | The day of the wedding I decided to get a blow out... And it was so bad. So bad. Ok, so, the blow out part turned out sort of okay, but then I asked the girl to pin my hair back a bit (which they claim to do all the time), and after a few tries of spraying and teasing my hair (then combing it out to try again), I ended with a ratty frizzy mess. It was terrible. I pretty much ran back to the hotel and washed my hair in the sink and started over (not to be a diva, but I feel like my hair is still recovering from the teasing trauma...). By the time I got to the ceremony I was just thankful that I still had hair on my head. SIX | The ceremony was lovely! Ginna's nieces and nephews are pretty much the cutest little people ever, and I would kidnap them if I could! Seriously, that cute. Ginna looked stunning and everything was beautiful. It was the perfect amount of fun but still respected the meaning of the event (side note: the wedding program told the story of when John and the groom, Blake, were rescued by the Coast Guard after crashing a sailboat in Lake Huron... Oops! Sorry Blake's uncle!). SEVEN | After the ceremony the newly married couple and the wedding party were all picked up by a trolley for a photo opp... And quite possibly the cutest photo opp ever! EIGHT | The wedding party looked great together. I can't wait to see all of the professional photos... The bridesmaid dresses looked awesome with the groomsmen suits, and the green and white flowers were so romantic with the navy! NINE | Once the bridal party finished with pictures, everyone loaded into the trolley for a ride to the reception. The weather couldn't have been more perfect: sunny and warm, but no one was uncomfortably hot. ONE | Once we arrived at the reception, John had a one track mind... His best man speech. Since John and Jim were co-best men, they decided on delivering the speech together, and let me tell you, they did fabulous! Their speech was the perfect amount of heartfelt and funny with little bit of razzing on Blake. TWO | The reception was absolutely beautiful and the flowers were out of this world!! Well done to Ginna's mom who planned it all... It was insanely gorgeous. And again, you will need to see the professional photos to appreciate the beauty and grandness. THREE | When the reception was over, many guests and those in the wedding party headed to Char Bar to extend the evening a bit longer. The evening ended by one of Ginna's bridesmaids and sorority sister, Mary Helen, rapping. She did good y'all. Not kidding either, I'm about to steal her (and a few others) from Ginna and make them my new besties! Looks like such a fun weekend and a beautiful wedding. Safe travels back home! Looks like it was a beautiful wedding! I love being guests at weddings! So fun! i live in charlotte and if you're talking about the south park area, i used to live right beside that nordstrom. trouble trouble! Looks like such a fun wedding! I loved your hair and the red dress!! Safe travels back home! Wow those flowers are beyond amazing! I can only imagine how gorgeous the entire wedding was! It sounds like you guys had such a great trip catching up with friends! Ahh so frustrating about your hair not turning out with the girl trying to tease it after the blowout! I was going to say it looks great in all of the pictures of you! OMG what a fun weekend! Those flowers are absolutely gorgeous! It looks like a beautiful wedding! Wha no shopping! Nice you had easy access right by the hotel. I don't even like shopping overly much but it's nice every once and a while. Sounds like a beautiful wedding minus the flights apparently! 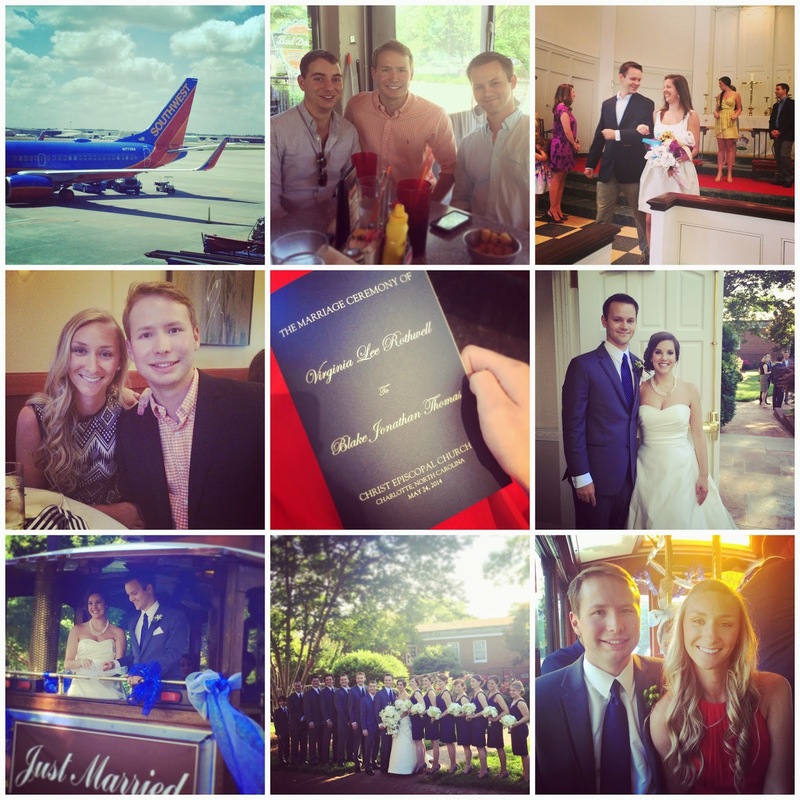 Looks like you guys had a great time and enjoyed a beautiful wedding! Too bad about the blow out, hopefully your hair will recover soon! I just came across your blog! It is so cute :) I went to college not far from Charlotte it is one of my favorite cities, sounds like an amazing weekend. Loved all these pictures on IG. Its been so long since I have been to Charleston. I WOULD LOVE to go back!! Seems to be a blogger favorite spot, too! Looked like a beautiful wedding!!! So not cool on the bad blow out on your hair! Beautiful wedding!! Looks like you had a fun weekend minus the hair disaster! OMG our rehearsal was SO stressful, make me a nervous wreck the rest of the night! The only time throughout the whole process that I was stressed! Those flowers and GORGEOUS and you look beautiful! What a fun time! And it looks like their decorations were gorgeous! Sounds like an amazing wedding!!! The photos are great and ummm I SO wish I had one of my bridesmaids rapping at my wedding hahaha hilarious! You looked flippin' adorable btw!! Omg!!!! You poor girl!!!! I'm sooooo overly paranoid about a bad haircut/style and this totally proves my point! You look cute in your pictures though :) oh and I hate being rushed to get ready! Okay...now that I sound crazy vain. It looks like y'all had a fabulous weekend! That trolley is such a cute idea!!!! Sounds like a fantastic weekend (hoping you guys made it back quickly and that work wasn't too painful yesterday with the delayed flight!). That hairstyle disaster would have totally stressed me out too, but you definitely salvaged it and made it look lovely! What a beautiful wedding!!! I love Houston! A weekend in Salida, Colorado!